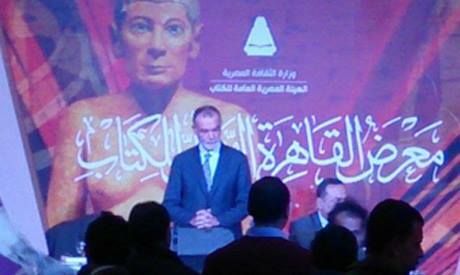 French historian and Arabist Jean Pierre Filiu ended his speech at the Cairo International Book Fair on Monday on an angry note, after the Egyptian audience barraged him with their theories about American-Zionist conspiracies against Egypt and the Middle East. Filiu, the author of Best of Enemies: A History of US and Middle East Relations, spoke for an hour on the common challenges and threats posed by the Islamic State militant group and its affiliates in Egypt and Libya, arguing that Europe and the Arab world share these challenges and the threats as well thus should cooperate to face them. The French historian went on to track the historical emergence of the IS group saying their origin dates back more than a decade to when the US-led coalition invaded Iraq. Filiu called the invasion a "disastrous mistake," that we are paying for now. Filiu discussed the terrorist groups that gave birth to IS, citing jihadist Abu Musab Al-Zarqawi, the leader of the Al-Tawheed wal-Jihad group, who was killed in an American airstrike and was known for his brutality. Filiu discussed Zarqawi's development and his allegiance to Al-Qaeda, as well the capture of Abu-Bakr Al-Baghdadi by American troops. "I wish to meet that American officer who (subsequently) released Al-Baghdadi for good behaviour," he commented sardonically. The writer commented that when the Iraqi soldiers fled their posts in the face of an IS onslaught, they left billions of dollars of US-donated equipment, making IS the richest and strongest terrorist group ever, at the expense of the American taxpayer. At the same time the US refused to arm the Syrian opposition fearing the weapons would fall into the wrong hands. Although Filiu vehemently criticised US policies in the Middle East, especially the decision to dismantle the Iraqi army, whose generals now are providing IS militias with their expertise, he didn't accuse the US of directly creating the group. "There is no conspiracy, there's idiocy and madness," he said. "We don't only face the threat of jihadists; we face the remains of Saddam Hussein's army, armed with US army equipment. We are paying the price of a decade of American madness." When political analyst Amr El-Shobki opened the discussions for questions after Filiu finished his lecture, the audience instead started to give their thoughts, dismissing his dismissal of conspiracy theories. “You can't deny there is a conspiracy; saying that there is no conspiracy and there is only idiocy isn't true, there is a conspiracy and it will stop at the doors of Egypt," commented one audience member. “France is a good military power in the world; why doesn't your country go to the US and confront it with the fact that it made IS?” asked another. A third commenter commented: "As an Egyptian I'm sure that there is an American-Zionist plot to dismantle the Middle East, and they made IS." Filiu seemed a bit uncomfortable and asked the audience in Arabic and French to ask questions and not to give speeches, but the floor ignored him. Angered, he decided not to take any more questions from the audience, despite El-Shobaki's attempts to calm him and get him to receive more questions. "We need to think rationally,” El-Shobaki told the audience. “Do you think the Europeans and Americans want to destroy the Middle East and tear its countries apart so they receive a flood of migrants and a chaos they can't deal with? I don't think so; they want us to be allies who can co-operate." "Order is the most important thing,” responded Filiu. “I think you understand order in this country; honestly if you say that IS is an American-Zionist conspiracy, I can't do anything about that. Bravo! You say you know it and are sure of it, so I just hope you stay here in your region and show me how you are going to solve this. We need a real coalition between the south and the north of the Mediterranean; the Russians are not doing anything positive, they are slaughtering the Syrian people and opening the door for IS. What is happening is a disaster and we are going to pay for this." "After 9/11 we were able to stop Al-Qaeda; the whole world was united against it.” he continued. “They are still there but they couldn't carry out any significant operations like 9/11; now we are not united and have different priorities, Saudi Arabia wants to get Assad's regime, the Iranians are concerned about the Saudis and Turkey is busy with its rivalry with the Kurds, no one is paying attention to IS and every party has its own priorities."